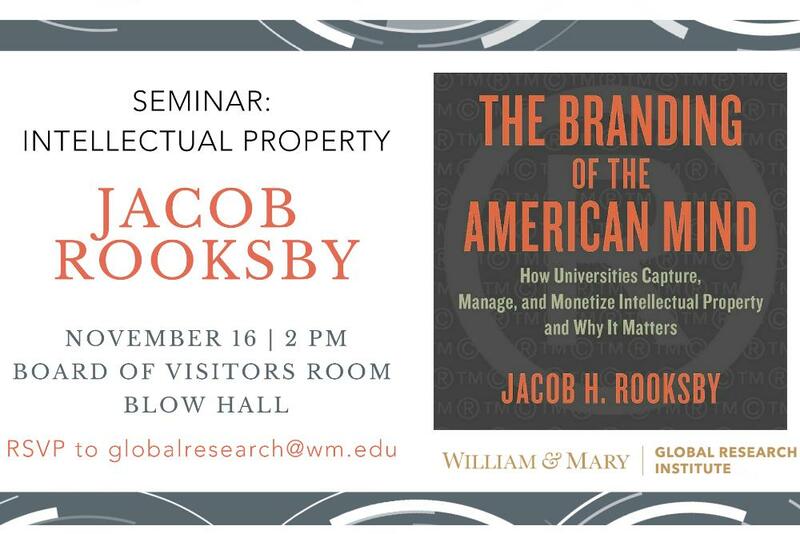 Please join us on Friday, Nov 16 at 2 pm for a multi-disciplinary seminar on intellectual property by Jacob Rooksby ?04, Dean of the Law School at Gonzaga. Jacob?s book The Branding of the American Mind touches on important issues in law, policy, business, and university strategic planning. In the book, Jacob examines how, whether, and why universities seek to convert intellectual property into revenue and how such a quest interacts with a long held value of both public and private universities: service to the public interest. Space is limited, RSVP required to globalresearch@wm.edu by Thursday, Nov 15 at 5 pm to reserve your spot.